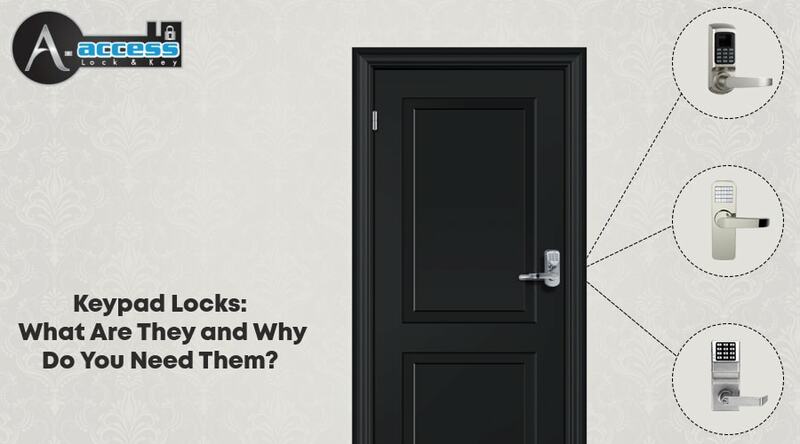 This post from our bonded Locksmith in Charlotte relates to keypad locks, their advantages, and why they are better than ordinary locks. One of the most famous additions to the advancing lock and key systems in the world today is the use of keypad locks. They are modern and have proven themselves to be effective and convenient. A keypad lock is a lock with a keypad of usually 9 buttons. With these kinds of locks, all you need to do is enter your secret pin number using the electric keypad, much like you would at an ATM. The code is composed of numbers from the digits on the lock, for example, 6669 or 80085. No physical key is required. This has been used for safes and high school lockers. Even banks are moving to this method of security. Why choose keypad locks over regular vanilla locks? Unlike keypad locks, ordinary locks are usually more vulnerable to lock picking and being compromised. Someone can just as easily copy regular locks. It would be easier for a burglar to access your house, especially if you have a previous tenant. If you want to increase your security using keypad locks, you can have one installed outside and another one installed inside. You can have distinct codes for each lock to lower the risk of someone getting in even when they know the code for the outside lock. There are even keypad door locks that input the biometric features, such as an eye reader, fingerprint reader, or an electronic authentication card. Being keyless comes with several advantages. Why do you need keypad locks? When keys are not involved, there is no chance that you will get locked in or out of your house. It will save you from the inconvenience and cost of being shut in or out of the building. You don’t need to keep remembering where you kept the spare key or where to get help in case the lock gets broken and needs to be replaced. If you don’t want anyone else to know the code to your lock, change it regularly. As long as you remember the code for your lock, you are the only one who can access it. No one has the chance to steal a key and gain entry. You also won’t misplace a key and spend hours searching for it. Keypad locks are also ideal for working parents who are not always home when their kids arrive from school. There is no need to give the kids copies of your home keys or keep them under pots or mats so they can open the door. Doing so will only increase your security risk if someone happens to stumble upon those keys. Use keypad locks for a safe and secure household. If you have decided to install keypad locks on your home, you can call A-Access Lock & Key at 704-545-5410 for help. We have licensed and experienced technicians who can come to you on time using our mobile locksmith service van. We operate from Monday to Saturday, from 8 AM to 6 PM, and from 9 AM to 3 PM on Saturday. We may not be a 24/7 locksmith, but we will surely come to your location wherever you are in the area. All our services are bonded and insured. We are high-tech and use the latest and greatest versions of equipment. If you want a quality Locksmith in Charlotte, North Carolina, we are the one for you. We are the recipient of the 2013 Super Service Award given by Angie’s List and has managed to maintain an A+ rating from the Better Business Bureau. This only shows the kind of quality service that you can get from A-Access. We have installed keypad locks for homes all over Charlotte and surrounding areas and can do the same for you. If you need our services, just dial 704-545-5410 and we’ll rush to your aid right away! Install keypad locks for your premises through our Expert Locksmith services!